When the BBC’s New Broadcasting House (1976) was demolished on Oxford Street in Manchester in October 2012, thousands of passers-by witnessed the violent death of a large building. Over the course of a few weeks, the building was transformed from ruin to rubble, and thence into just one more unimaginative (yet ubiquitous) Manchester car park. 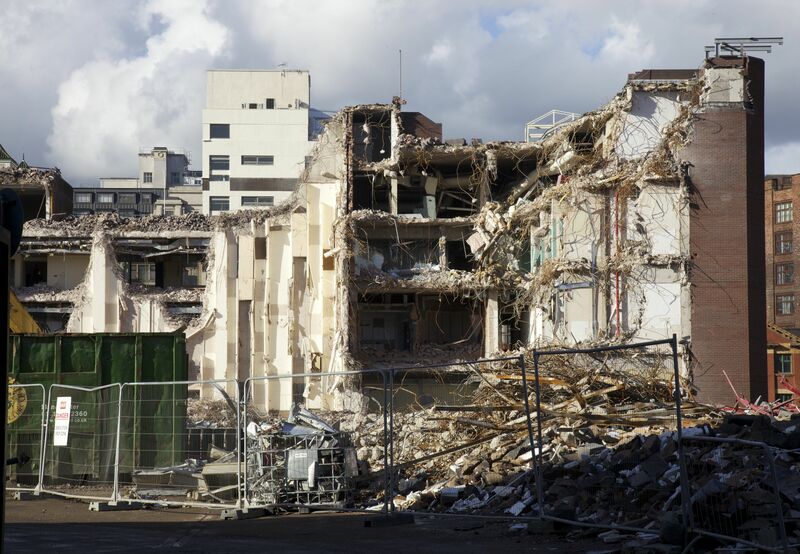 Demolition is perhaps the most commonplace form of what Marshall Berman has termed ‘urbicide’, that is, the deliberate destruction of the built environment of cities. And yet it’s certainly the most ignored: buildings come and go, their unmourned deaths usually heralded by long periods of decline, marked by the failure to find new uses for obviously defunct structures. 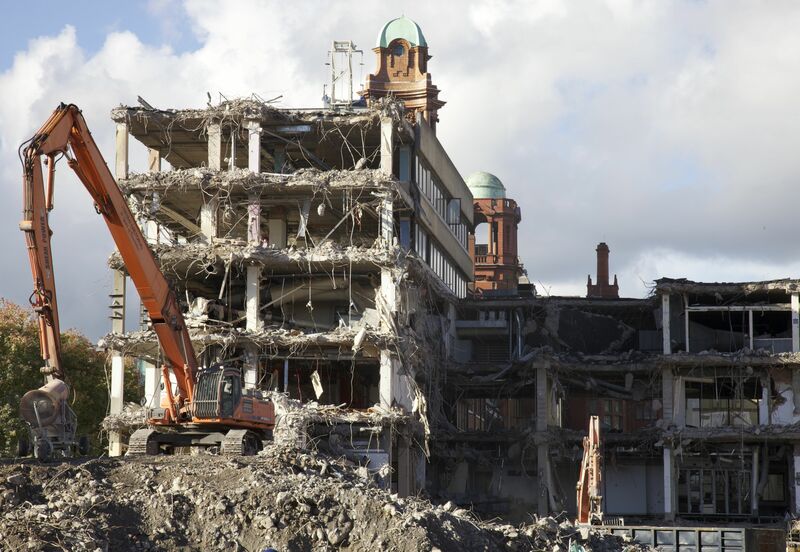 Deliberately contemplating buildings undergoing demolition is a transgressive form of looking. Seeing a building being killed is a discomforting, even shocking experience. Buildings – even long-empty ones – are essentially anthropomorphic structures, designed to be lived in and to be shared spaces of existence. Gaze at a building being demolished long enough and you begin to feel the pain of that death: its broken walls, gaping windows, and twisted metalwork eliciting a kind of bodily sympathy in the viewer. The violence of demolition also contrasts with the serenity of the ruin. Where, with the ruin, nature is allowed to re-establish her former claims to the building, producing (at least for a time) a peaceful sense of equilibrium, the building undergoing demolition is violently annihilated by the very tools that raised it up in the first place. No wonder that most demolitions are shielded from public view behind makeshift screens. 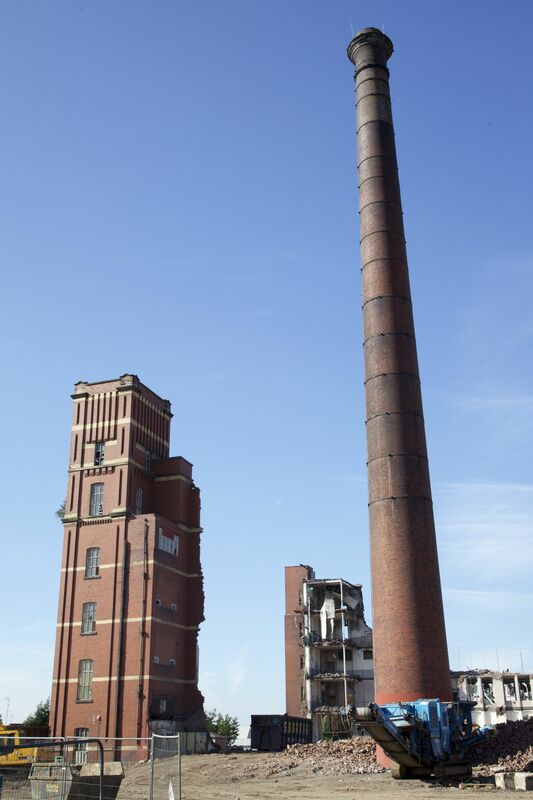 Demolition of Oldham Twist Mill (1883), September 2013. Representations of demolition are thus transgressive in that they both expose and forestall the violence of architectural annihilation. On the one hand, photographs articulate the half-demolished building as somehow still existent, even at the moment of its death – the architectural equivalent of a coroner’s report perhaps; on the other, the exposure of the building’s insides during demolition produce revelatory views of architecture – that is, glimpses of the otherwise invisible ‘soft’ interiors (perhaps most powerfully represented in Rachel Whiteread’s spectral sculpture House (1993)). ‘Demolition of Hungerford Market’, Illustrated London News, 27 December 1862, p. 705. Demolition also suggests new kinds of urban aesthetics, given widespread expression in nineteenth-century London when modernisation produced unprecedented scenes of urban ruination. So, when the Hungerford Market near the Strand was demolished in 1862 to make way for the Charing Cross Railway Station (1864), the Illustrated London News found in the resulting scene of destruction a powerful new aesthetic of modernity: a vast, dark absence flanked by houses on the brink of destruction, and the shadow lines of staircases, ceilings and floors imprinted, like Whiteread’s House, on their remaining walls. 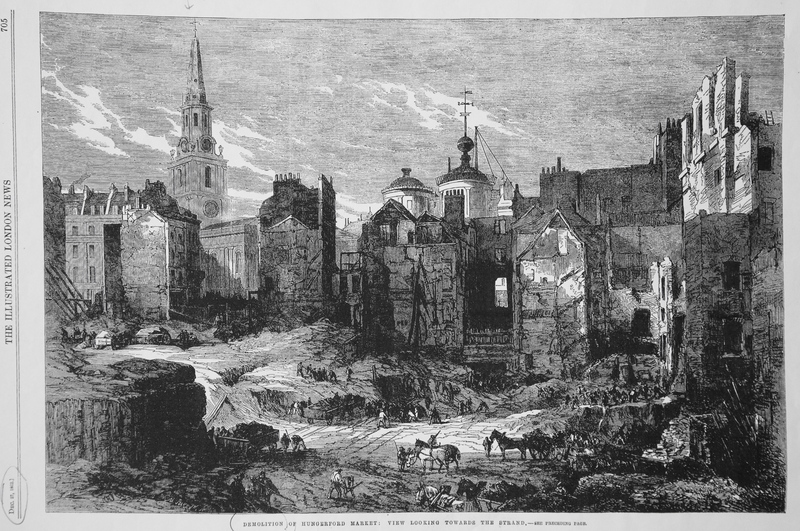 For the Illustrated London News such destruction produced a great deal of visual interest, in effect a new form of urban picturesque; yet in representing such a scene at all, the newspaper also exposed the urbicide that is common to all forms of modernisation. Yet, as Lynda Nead has argued, the illustration is also a permanent representation of the archaeology of modernity, revealing that the latter is always haunted by the spectral presence of the past, no matter how quickly it tries to obliterate it with the promise of the new. Interesting post Paul. Recently observed the demolition of the Agilent Technologies (formerly Hewlett Packard) building in South Queensferry which had lain empty for a couple of years. It’s phased destruction easily observable from the passing train. It was reduced to ‘nothing’ in weeks, When built I guess this facility was very much a vision of the future based on a ‘Silicon Glen’ economy. It was also a bit of a shock to see what appeared to be a ‘modern high-tech’ looking building ripped open to expose its innards and progressively disappear on a daily basis. Understand the land will now be used for housing. The future can become redundant relatively quickly. Thanks! Yes, something else happens when the ruined building was also once a futuristic one. I kind of heightened melancholy, but also the exposure of a truth. Great post. I have images (somewhere) of the demolition of Norwch’s Rowntree factory, which now has its former space occupied by Chaplefield, a large shopping centre (they don’t use the vulgar term ‘mall’ but it is). For months following the demolition our tiny garden a few hundred metres away had regular visits from rats. I can only assume that they were temporarily homeless. Thanks Laurence. Yes, the colonisation of ruins/abandonments by flora/fauna is an important aspect of their ‘post-human’ life. Interesting to hear of the consequences once those ruins are erased! I like to gaze a these sites too. I like to think of demolition as reverse construction – like running the film backwards, but then spotting how the motions change (necessarily) between assembly and disassembly. Something strange is revealed in that asymetry. Thanks Luke. I’m sure this has already been done, but wouldn’t it be interesting to film a building going up and being demolished and then to play one of those films backwards? Then you’d see like-for-like…or not-like-for-like. 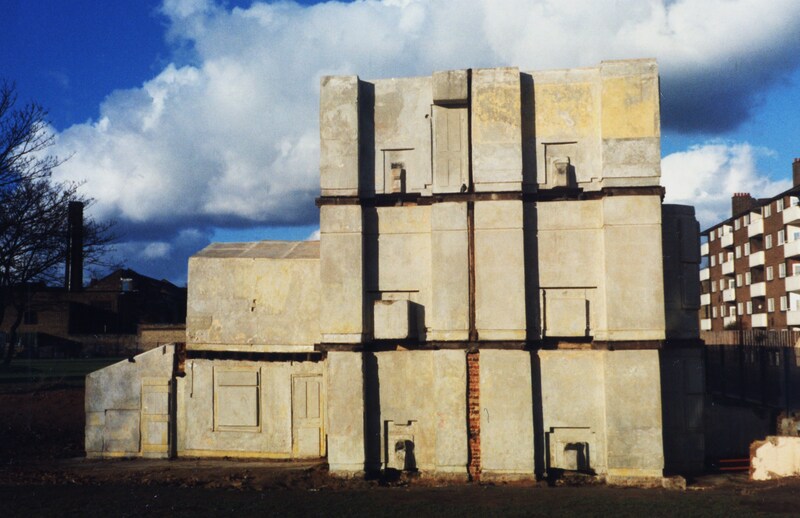 There’s also a sense in which both processes (construction/destruction) contain ruin within themselves and suggesting perhaps that ruin might represent a kind of resting point between the two – an equilibrium. Ever since I saw my first building being demolished (a large 60s office block) as a child, I remember feeling a tremendous sadness, but couldn’t turn away either. I think it’s something to do with the thought of all the work that went in to making the building that I find upsetting. With the destruction of more and more recent buildings, which still look shiny and new (Marco Polo House in Wandsworth being a current example), I find it even harder to contemplate. You can see how much thought went in to making these attractive and luxurious environments and to witness it being broken right before your eyes is quite moving. What I also find fascinating is how it exposes the complex HVAC and M&E systems that are normally hidden from view in suspended ceilings etc. I admire the engineering that goes in to making systems like that in buildings. Shame it isn’t re-used. Most of the components of these recent buildings have loads of life left in them when crushed. Thanks for your comments. Yes, I completely agree with you about the fascination of demolition and also the sense of sadness it provokes. What’s really sad is that often buildings are destroyed only for nothing to replace them – i.e. they get turned into car parks (at least this is what usually happens in Manchester).